Introduction: The recent discovery of enhanced glucose tolerance following bariatric surgery has sparked renewed interest in investigation of unchartered underlying pathways of glucose homeostasis. It is hoped that delineation of the active pathway effected by bariatric surgery may be the first step in the creation of a novel therapy that could be applied to the non-obese type II diabetics as well. Mice provide the optimal model to investigate this physiologic pathway because of the wide availability of genetically-modified mice. However, creation of a bariatric mouse model has proven to be challenging because of the technical complexity and formidable nature of this surgery coupled with the natural fragility of these small rodents. We have created a sleeve gastrectomy mouse model using a simplified technique to study the effects of bariatric surgery on glucose tolerance and beta cell proliferation. Herein, we describe the surgical technique data collected pertaining to the effects of surgery on pattern of weight loss, serum glucose, serum insulin and beta cell proliferation. Methods: 19 mice were randomized to undergo either sleeve gastrectomy(SG) (9) or sham operation(SH) (10). Weight and serum glucose were measured 3 times weekly and serum insulin measurement and pancreatic harvest were performed at the time of sacrifice. Five mice from each group were sacrificed after 1 week and the remainder were sacrificed after 1 month. Results: Survival was 100%. The SG group demonstrated an initial drop in weight and serum glucose as compared to SH, which normalized by 1 month following surgery. SG mice demonstrated significant gastric re-expansion following surgery, often returning to approximately original size after 1 month. Pancreatic analysis demonstrated no significant differences in beta cell proliferation between the two groups after 1 week or 1 month. 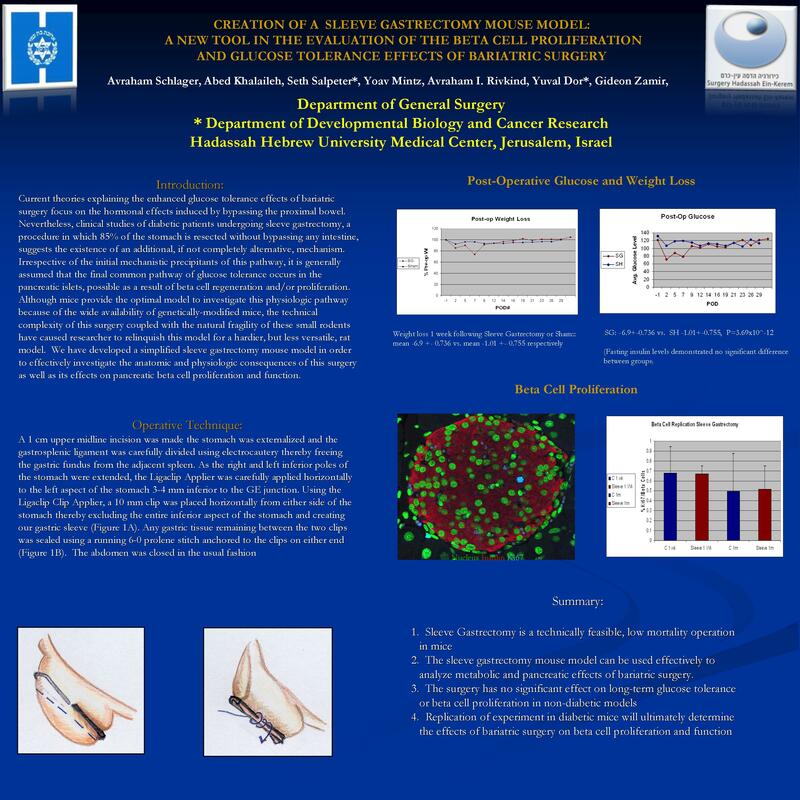 Conclusion: The simplified sleeve gastrectomy technique is an effective tool to investigate glucose tolerance, weight loss, and pancreatic islet effects of bariatric surgery in a genetically tractable organism. Normalization of glucose and weight in the SG group may be related to noted gastric re-expansion following surgery.